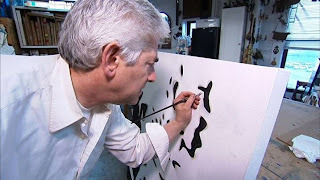 Saturday July 27 at 10:30 AM PBS's Religion & Ethics Weekly featured a profile of artist Tobi Kahn: "I believe art can take you on a journey and I like being the guide…There’s a saying that everyone is tzelem elokim. We are created in the likeness of God. I believe in that, and when I see something beautiful—something happens to me and I would call that holiness, and I want my work to do that." Among his projects, Kahn is doing the artwork for the new building of the interfaith HealthCare Chaplaincy in New York City. To improve the effectiveness and efficiency of healthcare through the innovative ways chaplains promote and advance palliative care research, education and practice. View the feature on the R & E website here. Tobi Kahn is a Jewish Art Salon member and on our Advisory Board.